For now, since it’s Friday, I’m going to write for 5 minutes with these awesome people. Just for the love of words -and community. No editing, just letting go. Join me? The prompt this week is Look. Standing there in the park I’m surrounded by little children. The boys roaring wildly at play, while the girls climb and slide and swing. The stereotypes are mostly true on playgrounds–the boys play one way, the girls, another. I watch my smallest climb to the top of the play set, her sweet face grinning brightly in the afternoon sun. We’ve had the longest day, between ballet class, picking our way through the pumpkin patch, and then delivering pumpkins. We took a quick break for lunch and now, the park. The last time I was this tired, I held this wild girl against my chest, all slung and happy to be pressed in. She turns 3 today. I wonder where the last three years dashed off to? Honestly, with four kids, it can get blurry some times. There’s a constant need and tug at me around the clock and all into the next day and the days, they glaze over sometimes when I work to remember them. Today we’ll celebrate this girl. I’ll remember how I knew after our third that this fourth child was missing. I recall looking around often, counting three little heads and trying to make sense of that feeling that someone was missing. The hole in our lives for her sat wanting for just 22 months before she came to us. We’ve never been the same, my husband and I. These kids have wrecked us in all the great ways and as we gather around this one to watch her blow those three candles out, I’ll choke back tears of thanksgiving, for how God fills my heart with her sweetness, for how each one of them bares the mark of a God who loves and answers prayers. Looking at them, I see His face, His joy walking around. 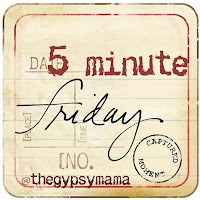 Next week I’ll be writing my Five Minute Friday post live! I can barely stand it. If you’re attending Allume, I sure hope you’ll come to this meet up and say Hi. I’d love to meet you! Ps: If you are going to Allume, perhaps you might find this post helpful.